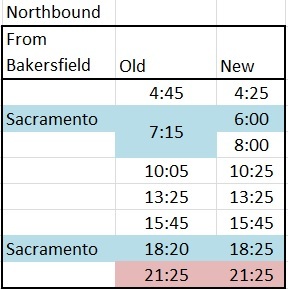 7th daily San Joaquin train launches on June 20 – a look at the new schedule! Amtrak’s new 7th daily San Joaquin train will launch on June 20! A few months ago, I reported that final touches were being put on a new 7th daily train between Bakersfield and the Bay Area. Although they missed the predicted launch date of June 6, you can now purchase tickets reflecting the new schedule that kicks off on the 20th. 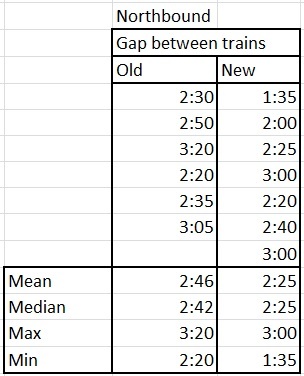 That’s how I was able to see what the new times look like, because the full version has not been posted on Amtrak’s page, Let’s take a look! 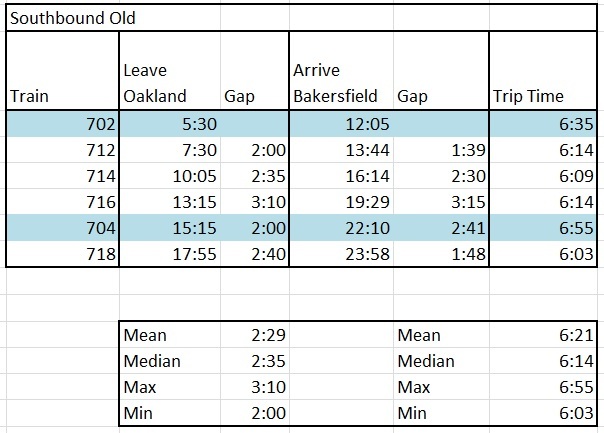 We start by looking at northbound trips from Bakersfield to Oakland. 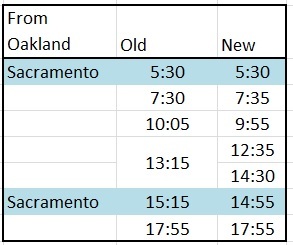 The blue trains in the image go to Sacramento. That means that in Stockton you transfer to an Amtrak bus if you want to reach Oakland or San Francisco. The red “train” in this image is actually a bus. It is intended for folks coming from Southern California, and terminates in Fresno. It requires purchase of a connecting rail ticket, due to lobbying by Greyhound. This is a little unexpected. 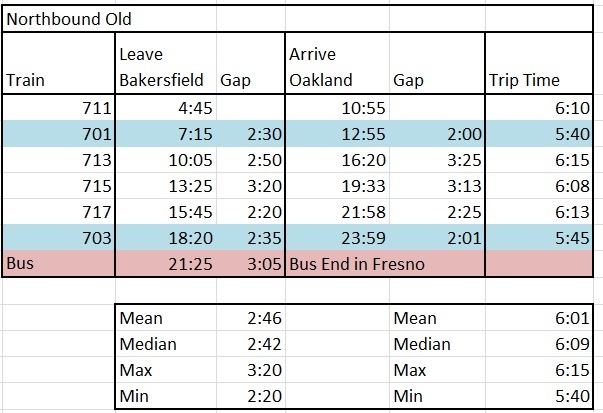 While the morning schedule makes a lot of sense, it is baffling that they want to keep the last train from Bakersfield before 6:30pm. It seems that the priority was to lessen the gaps between trains, rather than to expand the scope of service. Previously, there was an average wait of 2 hours and 46 minutes between trains – now it will be 2:35. 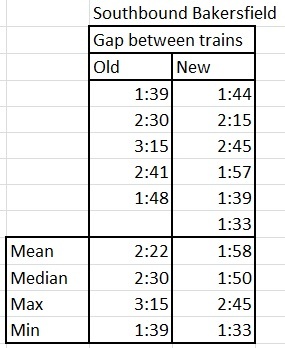 The largest gap used to be 3:20, and now it is 3:00. 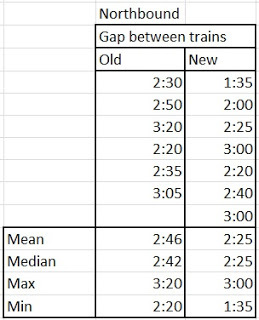 The smallest gap used to be 2:20, and now it is 1:35.
schedule gets you into Oakland at 10:26am – a perfectly adequate time. One of the challenges for planning this kind of schedule is that you’re also taking into account folks coming from LA or even San Diego as well. Previously, the “late” bus left LA at 1:35am, now it will leave at 1:15am. That’s actually a littler better for those using public transit to attend an entertainment event in LA, one which most likely ends around midnight. However, I have to trust that the folks planning this have some decent ridership data, including ticket sales and surveys, to back up their choices. Additionally, it is important to note that Amtrak California does not control the tracks. They used tracks owned by Burlington Northern Santa Fe and Union Pacific. That means they get to decide when they want to let Amtrak run through. When the new train was announced, it was to depart at 4am. It is possible that the freight companies pushed it to 4:25. It is also possible that other concerns, such as labor or noise ordinances affect times trains are allowed. One of the advantages of the new High Speed Rail system is that the tracks will be 100% owned by the state. The southbound changes are odder still. The first and last trains of the day did not change, keeping the span of service exactly the same as it is now. This means the last southbound train leaves at 5:55pm, which frankly is pretty damn early. (Note that again blue signifies a Sacramento train, meaning from Oakland you are put on a bus to Stockton). 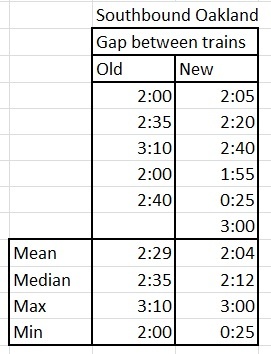 The second and 3rd trains saw only minor adjustments, which could have easily been due to other factors. It is the middle of the day that sees more service. Rather than a single train at 1:15pm, there are now departures at 12:35pm and 2:30pm. The 2:30pm train is really weird, because an Amtrak bus departs just 25 minutes later. Even stranger is that the bus requires a 35 minute transfer at Stockton. Padding is expected because while the buses will wait for the train, the train will not wait for the bus which might get stuck in traffic. However, unless you just missed the train, I can’t see a scenario where taking that bus would make any sense. 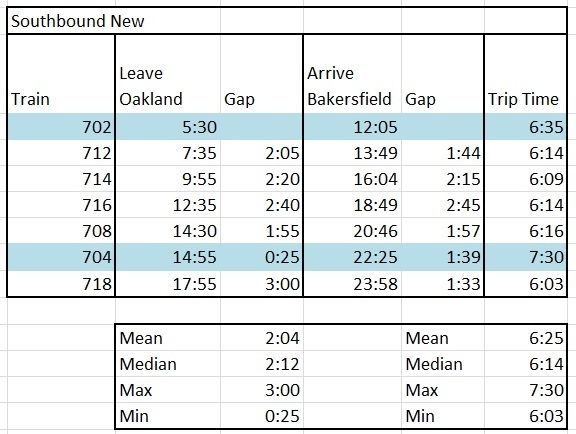 However, when looking at train arrival times in Bakersfield, the gaps make more sense. This is due to differences in trip times and the bus transfers. Again, I can only hope they have ticket data that backs this up, because in my mind, an even 3 hour wait seems like it would be best for the average traveler. It is important to note that planning has already begun on an 8th train, one that would operate from Bakersfield to Sacramento, and presumably with bus connections from Stockton to the Bay Area. It is unclear if that new service can run in the near term, or if Amtrak has to wait for their new trains to start arriving in 2018. Additionally, there has been talk for over a decade in adding a second track in Fresno, so trains could spend the night. 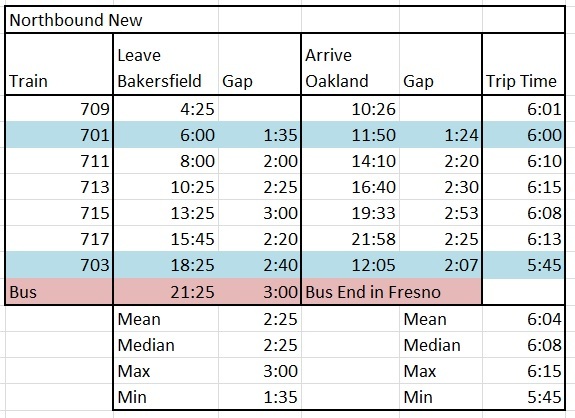 That would allow the Amtrak bus that terminates in Fresno to be replaced by a train, providing a later northbound option from Bakersfield and an earlier southbound option from Fresno. Let’s hope that happens soon. 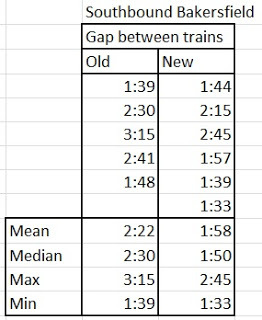 Finally, here’s the same data presented in a different form, with trip times included. I will follow up in a few months to see if ridership ticks up with the new service.